HUMBOLDT PARK — A group of students, parents and activists marched in front of Ald. 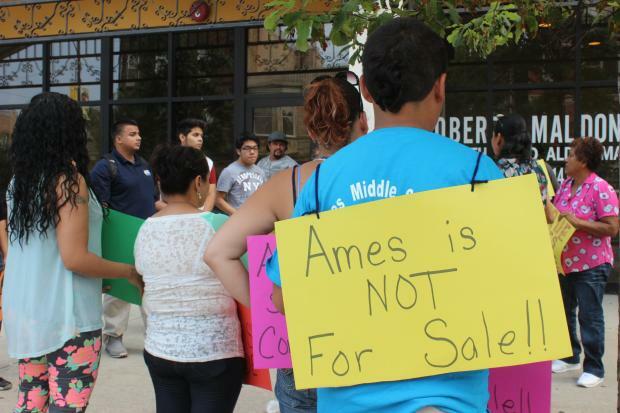 Roberto Maldonado's 26th Ward office Monday afternoon to protest efforts to move a military school into Logan Square's Ames Middle School. Maldonado has long been pushing for the Marine Math and Science Academy, a high school now on the Near West Side, to move into the Ames building at 1920 N. Hamlin Ave., but parents have continually pushed back against the plan, saying the alderman has left them out of the conversation and that the military school's academic record isn't very impressive. "I mean, me personally, I don't have a problem with a military school," said Christina Torres, whose son will enter Ames in September. "My problem is that he [Maldonado] hasn't come to the community." The complaint has been often repeated, and those at the protest said Maldonado once again tried to avoid them by holding a last-minute community meeting last Wednesday without contacting any Ames parents. "None of the people here received a call or an email," Torres said. "It was only elderly people, a busload of youth from the Marine academy and parents and kids from other schools." Torres and others, including Ames English and history teacher Elizabeth Koutny, said a Maldonado staffer referred to the school as "gang-infested" in robocalls to area residents. The alderman's office confirmed the calls were made, but did not elaborate on the gang comment. Koutny, a union delegate who has worked at the school since it opened in 1998, echoed other teachers and parents in their praise of Turon Ivy, Ames' popular new principal. "He has a vision," she said. "We're very supportive of him." Ivy has signed on for at least three more years at the school, which has seen improvement over the years, according to CPS records. Though it is unclear whether or not the Marine academy's military school curriculum would affect Ames middle schooler students, parents and teachers fear the school would become overcrowded if the high school moved in. Test scores at Ames still fall below CPS average in most subjects, but the school has been taken off academic probation and has seen improvement in every subject, including science this year, previously its weakest subject. The Marine academy's scores also fall below the CPS average, and like Ames, is at a Level 2 CPS performance rating — Level 1 being best and 3 being worst. Other high schools in the area are Level 3 schools, however. Maldonado did not come out of his office during the protest, which came during his regular ward night hours. He later spoke to protesters in his office, after they had signed up for talk time, neighborhood activist Leticia Barrera said, but his mind didn't seem to be changed. Maldonado said that moving the Marine academy into Ames was a good idea that would give area high school students more options. He dismissed protesters' claims that he was trying to exclude them from last week's meeting. "We posted our community meeting, and we had 180 people that came," he said. As for why he's so insistent that the Marine academy move into the Ames building, he said it's just about providing more options for kids, particularly in terms of high schools. All the other area high schools — Clemente, North-Grand and Kelvyn Park — are on academic probation with Level 3 performance ratings. "It is an additional option," he said. "I don't know any parent that would not want additional options."